Lanyard with Metal Bulldog Clip - 3/4"
People will become "attached" to this marketing tool and your company when you feature it during upcoming promotional events. Choose this 3/4" polyester dye sublimated double bulldog clip lanyard as a handy giveaway during tradeshows, conferences and fundraisers. 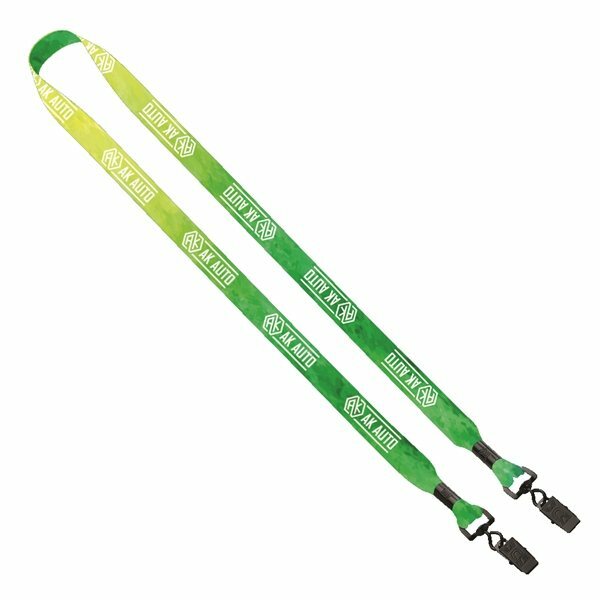 Enhance your promotion by ordering this lanyard today. Dye-sublimation is a CMYK printing process. PMS colors that are called out will be matched as close as possible. Exact PMS or CMYK color match not available. For BEST results, supply vector artwork and call out PMS - Solid Coated colors. Art files that are submitted as bitmap, jpg or files with gradients cannot be printed with PMS values. Due to the print process we are unable to ensure alignment of the backside imprint on Dye-Sublimated lanyards. Placement of your logo will be unique on each piece, if this is an issue we suggest proceeding with a solid color backside instead. Excellent. Such as the color and imprint. We were on a time crunch and they turned out perfectly. No negatives at all. Excellent quality overall. The product was well received. Everyone had their own idea on what they would be using them for. Our logo looked great on it. I recommend this 100%.